Published: March 7, 2018 at 08:01 p.m. Updated: March 29, 2018 at 05:13 p.m.
After a head-turning performance at the NFL Combine, linebacker Shaquem Griffin shows off for NFL scouts during pro day at the University of Central Florida. In Louisville, despite not running the 40-yard dash, quarterback Lamar Jackson put on a show to scouts by throwing participating in position drills. On other college campuses around the country, USC' Sam Darnold, Georiga' Nick Chubb, Oklahoma' Baker Mayfield, Wyoming' Josh Allen, UCLA' Josh Allen and Penn State's Saquon Barkley showcase their talents ahead of the 2018 NFL Draft on April 26th-28th in Dallas. 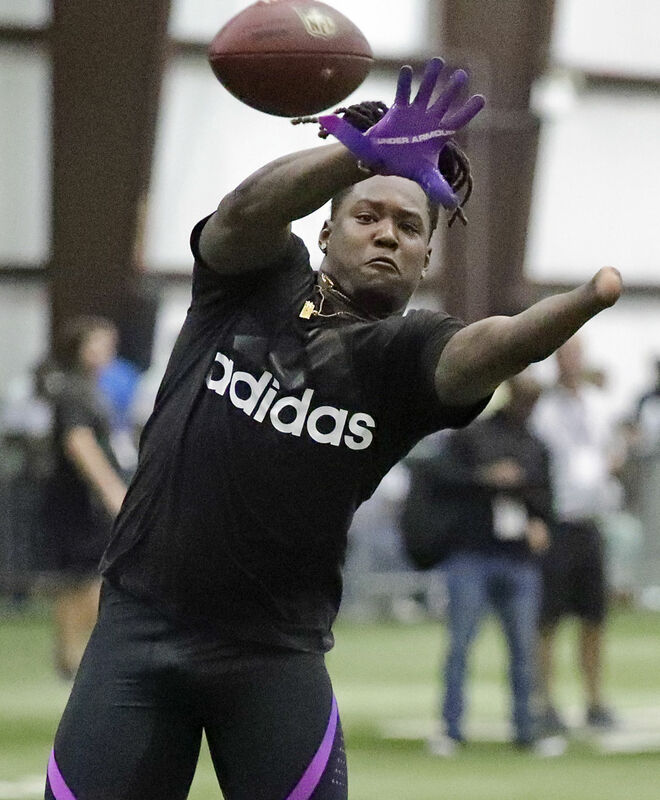 Central Florida's Shaquem Griffin catches a pass during a drill at UCF's Pro Day, Thursday, March 29, 2018, in Orlando, Fla. Pro day is intended to showcase talent to NFL scouts for the upcoming draft. Central Florida's Jordan Akins runs a drill at UCF's Pro Day, Thursday, March 29, 2018, in Orlando, Fla. Pro day is intended to showcase talent to NFL scouts for the upcoming draft. Lamar Jackson warms up before working out in front of NFL scouts during Louisville's football Pro Day, Thursday, March 29, 2018, in Louisville, Ky.
Former Cleveland Browns quarterback Johnny Manziel throws during drills at his alma mater during Texas A&M's football Pro Day in College Station, Texas, Tuesday, March 27, 2018. Texas A&M University Aggies wide receiver Christian Kirk performs drills during Texas A&M Pro Day at the NCAA football team's indoor training facility on Tuesday, March 27, 2018 in College Station, Texas. Former Cleveland Browns quarterback Johnny Manziel, left, shares a laugh with Mike Evans of the Tampa Bay Buccaneers between drills at their alma mater during Texas A&M's football Pro Day in College Station, Texas, Tuesday, March 27, 2018. University of Wyoming quarterback Josh Allen (17) passes the ball during NFL Pro Day, March 23, 2018 in Laramie, Wyo. Defensive lineman Tracy Sprinkle runs a drill during Ohio State's Pro Day, Thursday, March 22, 2018, in Columbus, Ohio. Stanford's defensive back Justin Reid makes a catch during an NFL Pro Day on Thursday, March 22, 2018, in Stanford, Calif.
Stanford's defensive lineman Harrison Philips performs a drill during an NFL Pro Day on Thursday, March 22, 2018, in Stanford, Calif.
Quarterback J.T. Barrett runs a drill during Ohio State's NFL Pro Day Thursday, March 22, 2018, in Columbus, Ohio. Receiver Hunter Joseph runs a drill during Ohio State's NFL Pro Day Thursday, March 22, 2018, in Columbus, Ohio. Defensive lineman Jalyn Holmes runs a drill during Ohio State's NFL Pro Day Thursday, March 22, 2018, in Columbus, Ohio. Defensive back Denzel Ward runs a drill during Ohio State's NFL Pro Day Thursday, March 22, 2018, in Columbus, Ohio. Pittsburgh Steelers linebacker Ryan Shazier, left, is pushed along the field as players from the University of Pittsburgh they take part in the NCAA football team' s annual pro-day on Wednesday, March 21, 2018, in Pittsburgh. Southern California quarterback Sam Darnold throws a pass during USC Pro Day, Wednesday, March 21, 2018, in Los Angeles. Southern California running back Ronald Jones catches a pass during USC Pro Day, Wednesday, March 21, 2018, in Los Angeles. Boston College defensive end Harold Landry performs football field drills during BC Pro Day, Wednesday, March 21, 2018, in Boston. Defensive back Malik Rucker catches a pass during the Western Michigan University NFL Pro Day football drills, Wednesday, March 21, 2018, in Kalamazoo, Mich. Offensive linemen Matthew Modreske, left, and Chukwuma Okorafor run through drills during the Western Michigan University NFL Pro Day football drills, Wednesday, March 21, 2018, in Kalamazoo, Mich. Defensive back Darius Phillips performs a drill during the Western Michigan University NFL Pro Day football drills, Wednesday, March 21, 2018, in Kalamazoo, Mich.
Georgia linebacker Lorenzo Carter participates in a drill with Detroit Lions head coach Matt Patricia during Georgia Pro Day, Wednesday, March 21, 2018, in Athens. Georgia wide receiver Javon Wyms participates in the 40 yard dash during Georgia Pro Day on Wednesday, March 21, 2018, in Athens. Pittsburgh offensive lineman Brian O'Neill, left, goes through a drill with fellow lineman Jaryd Jones-Smith (55) during the NCAA football team's annual pro-day, Wednesday, March 21, 2018, in Pittsburgh. Georgia running back Nick Chubb participates in a drill during Georgia Pro Day, Wednesday, March 21, 2018, in Athens. Penn State running back Saquon Barkley (26) catches a football during Penn State Pro Day in State College, Pa., Tuesday, March 20, 2018. Penn State tight end Mike Gesicki (88) catches a pass during Penn State Pro Day in State College, Pa., Tuesday, March 20, 2018. Penn State safety Marcus Allen runs a drill during Penn State Pro Day in State College, Pa., Tuesday, March 20, 2018. California kicker Matt Anderson runs to kick during NFL Pro Day on Tuesday, March 20, 2018, in Berkeley, Calif. Anderson is Cal's all-time leader in scoring (316 points) and field goals (60). Penn State running back Saquon Barkley (26) is surrounded by media while being interviewed during Penn State Pro Day in State College, Pa., Tuesday, March 20, 2018. Barkley did not participate in drills. California's James Looney runs during a drill at an NFL Pro Day on Tuesday, March 20, 2018, in Berkeley, Calif.
Penn State linebacker Jason Cabinda runs a drill during Penn State Pro Day in State College, Pa., Tuesday, March 20, 2018. Former Florida State football defensive back Jalen Ramsey, left, who plays for the Jacksonville Jaguars, share some laughs with Derwin James during Florida State Pro Day, Tuesday March 20, 2018, in Tallahassee, Florida. Georgia Tech football player Antonio Simmons reacts after benching 30 reps during Georgia Tech's Pro Day, Friday, March 16, 2018, in Atlanta. Georgia Tech defensive lineman Francis Kallon participates in a drill with a member of the Atlanta Falcons coaching staff during Georgia Tech's Pro Day, Friday, March 16, 2018, in Atlanta. Atlanta Falcons NFL football team head coach Dan Quinn, left, speaks with Falcons quarterbacks coach Greg Knapp during Georgia Tech's Pro Day, Friday, March 16, 2018, in Atlanta. UCLA quarterback Josh Rosen rolls out during UCLA's pro day for NFL draft prospects in Los Angeles, Thursday, March 15, 2018. UCLA defensive end Matthew Dickerson runs a drill during UCLA's pro day for NFL football draft prospects in Los Angeles, Thursday, March 15, 2018. Former UCLA cornerback and wide receiver Ishmael Adams runs the 40-yard dash during UCLA's pro day for NFL football draft prospects in Los Angeles, Thursday, March 15, 2018. Oklahoma State quarterback Mason Rudolph passes during Pro Day for NFL football scouts in Stillwater, Okla., Thursday, March 15, 2018. Oklahoma State offensive lineman Larry Williams runs the 40 yard dash during an NCAA college football Pro Day in Stillwater, Okla., Thursday, March 15, 2018. Oklahoma State wide receiver James Washington displays his vertical leap during an NCAA college football Pro Day in Stillwater, Okla., Thursday, March 15, 2018. Oklahoma quarterback Baker Mayfield passes during a drill at an NCAA college football Pro Day workout in Norman, Okla., Wednesday, March 14, 2018. Oklahoma offensive lineman Orlando Brown lifts weights during an NCAA college football Pro Day workout in Norman, Okla., Wednesday, March 14, 2018. Brown had a historically bad NFL Scouting Combine and is trying to improve his falling draft stock at Oklahoma's Pro Day. Oklahoma linebacker Ogbonnia Okoronkwo runs across the finish line of the 40 yard dash during an NCAA college football Pro Day workout in Norman, Okla., Wednesday, March 14, 2018. Auburn defensive back Tray Matthews begins to use the bench press during Auburn's Pro Day, Friday, March 9, 2018, in Auburn, Ala.
Auburn defensive back Stephen Roberts runs drills as scouts watch during Auburn's Pro Day, Friday, March 9, 2018, in Auburn, Ala.
Auburn defensive back Carlton Davis catches the ball during drills at Auburns Pro Day, Friday, March 9, 2018, in Auburn, Ala.
Auburn running back Kerryon Johnson runs drills during Auburn's Pro Day, Friday, March 9, 2018, in Auburn, Ala.
Auburn's offensive lineman Braden Smith, left, and Darius James, right, run drills during Auburn's Pro Day, Friday, March 9, 2018, in Auburn, Ala.
New England Patriots coach Bill Belichick, left, and former Arkansas coach Bret Bielema, center, walk the field during Alabama's Pro Day, Wednesday, March 7, 2018, in Tuscaloosa, Ala.
Alabama's defensive back Minkah Fitzpatrick, left, quarterback Jalen Hurts, center, and Pittsburgh Steelers head coach Mike Tomlin watch during Alabama's Pro Day, Wednesday, March 7, 2018, in Tuscaloosa, Ala.
Alabama defensive back Tony Brown, works out before Alabama's Pro Day, Wednesday, March 7, 2018, in Tuscaloosa, Ala.
Alabama defensive lineman Da'Shawn Hand runs drills during Alabama's Pro Day, Wednesday, March 7, 2018, in Tuscaloosa, Ala.
Linebacker Rashaan Evans runs drills during Alabama's Pro Day, Wednesday, March 7, 2018, in Tuscaloosa, Ala.
Alabama offensive lineman JC Hassenauer runs drills during Alabama's Pro Day, Wednesday, March 7, 2018, in Tuscaloosa, Ala.
Linebacker Denzel Devall runs the 40-yard dash at Alabama's NFL football Pro Day, Wednesday, March 9, 2016, in Tuscaloosa, Ala.
Running back Bo Scarbrough runs drills during Alabama's Pro Day, Wednesday, March 7, 2018, in Tuscaloosa, Ala.
Alabama coach Nick Saban speaks to the media during Alabama's Pro Day, Wednesday, March 7, 2018, in Tuscaloosa, Ala.